It’s May 1st already…when did that happen?! May is my favorite month. It’s my birth month, Mother’s Day, the weather gets warmer but not so warm that I melt as soon as I walk outside, and it also marks the month that I started my weight loss journey… 5 years ago. Yup, that’s right. I made the decision to change my eating habits, start moving more and become healthy, 5 years ago! It honestly doesn’t feel like I’ve been at that long, and I think that is because I am still learning so much about being healthy. I am always trying new workouts, new recipes, new food and meeting new people who have a passion for different areas of health and fitness. While I still have my fair share of body issues, I am very proud that I have stuck with this lifestyle for this long and that I have not fallen back into my bad habits, like I did so many times in the past. Yes, I’ve had my nutrition slip ups. Yes, I’ve been a slacker when it comes to my workouts, but I’ve learned to notice the behavior and quickly correct it, which is a huge reason as to why I have been successful this time. To celebrate this milestone, I plan on incorporating more yoga/meditation into my routine. I always feel more relaxed and centered after doing yoga but I am not a yoga lover, so I always find an excuse to skip it. 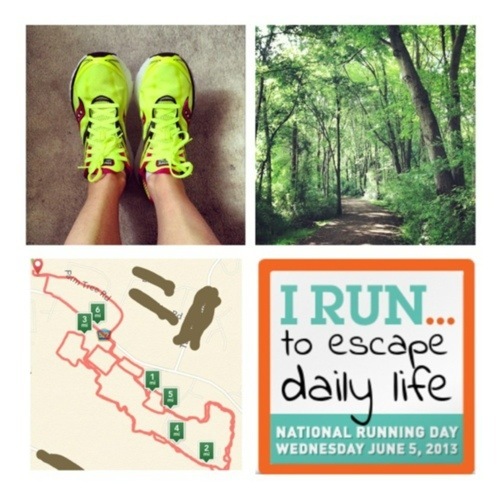 I’ll also be participating in the #50MilesInMay challenge that a friend posted on Instagram. If you would like to celebrate my milestone with me, start your own journey or just take your fitness to the next level, please join me on Facebook for this challenge. Prefer using Instagram or Twitter? 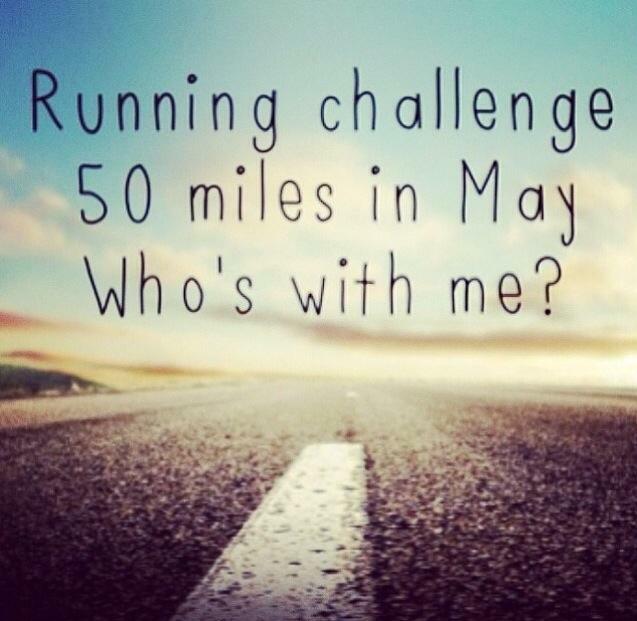 Use the hashtag #50MilesInMay to document your progress and make sure you follow me! Even if you don’t run, please join us. You can begin with walking, work your way to power walking and maybe even finish up with a light jog. It’s about leaving your comfort zone and finding out what you are really capable of. I’m a believer that things come into your life for a reason and I received proof of that yesterday. I’ve been day dreaming about running again. It’s been about 2 months since I’ve laced up and felt the wind on my face and I’ve been a little depressed about that. To me, there is nothing like the quality time I spend alone, with the sunshine and the fresh air, while pushing myself to new limits. Last year I ran all winter and I loved it. I actually did better when it was cold out, but this year, the Polar Vortex temps have made it to dangerous (in my opinion) to go out and enjoy myself. Yesterday, while checking Instagram, I saw that FitFluential posted a new challenge for March and the focus was running! I instantly got excited about this, since I’ve been daydreaming about hitting the pavement again. I tagged a few runner friends I’ve met on Instagram and they all responded yes to the challenge, so I’m really stoked to have not only a goal, but a support and motivation team too! If you would like to participate, use #FFMarchMiles when posting to Instagram or Twitter, because FitFluential has teamed up with Reebok for this challenge and two lucky participants will win some amazing Reebok gear! Now grab your running shoes, find a sidewalk, trail or treadmill and get moving! Once upon a time, there was a girl named Nikki. She began running in the fall and fell in love with it. She set a goal for herself to run 500 miles in 2013 and while some people thought she was crazy, she was excited. She ran all winter long, braving the snow, ice and frigid temperatures. She pushed herself to improve her form, avoid side stitches and set new PR’s. She participated in a Further Faster Forever contest and found that she was capable of amazing things… until an evil upper respiratory infection hit and sidelined her for a few weeks. The evil upper respiratory infection left her with the need for an inhaler and a fear of going out to run. She tried a few times and a combination of anxiety and asthma always got the best of her. Leaving her only halfway to her goal of 500. Then, the evil heat of summer came along and Nikki was not a fan of it, so she put her running on hold. She ran a few fun runs and logged a few miles on the days it wasn’t sweltering, but she was basically at a stand still. She attempted to run on the hamster wheel of death, in an air conditioned gym, but it just wasn’t the same. Part of what Nikki loved about running was the fresh air, changing scenery and the mind clearing effect the two had together. The hamster wheel of death just didn’t offer that, so the frustrated Nikki sulked off and just watched as runners tweeted and instagrammed about their runs. Finally, one October morning, the air was crisp and the humidity was gone. 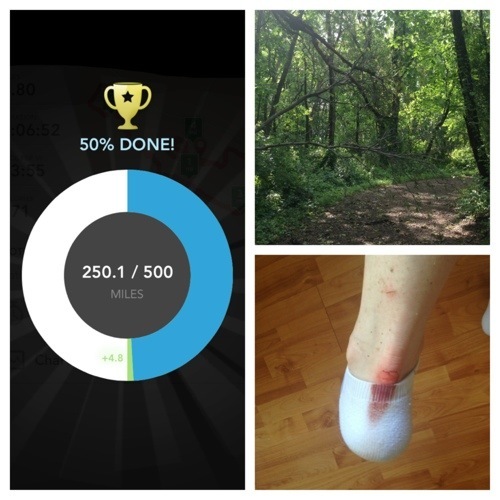 Nikki grabbed her running shoes, turned on RunKeeper and hit the trail for the first time in a while. Her head instantly cleared, her legs felt strong and her breathing wasn’t an issue. She finally made it to 300 miles and while she knows there isn’t much time left in 2013, she’s going to do her best to reach the goal she set. After all, the cooler temps, snow and ice never stopped her before. Leave it to me to run a 30 Day Yoga Challenge the month BEFORE National Yoga Month. I’m going to view it as being a trend setter. Maybe being a bit ahead of myself? Okay…okay…I don’t pay enough attention to these National “_____” Day lists, lesson learned! Thankfully the wonderful folks over at Athleta sent me an e-mail sharing a series they have put together with YogaGlo, which starts today! They’ll be offering a series of FREE on-line yoga classes beginning today, September 1st through the end of the month! Additionally Athleta will be hosting special events at both the Upper East Side and Upper West Side stores throughout the month! Please visit www.Athleta.com/Stores for details on events and free classes happening at both stores as well as the other NY locations in Scarsdale and Manhasset. If you participated and enjoyed the 30-Day Yoga Challenge I hosted over on my Facebook Page in August, or missed that but wanted to try a month of yoga, I definitely recommend checking this out. I love that they are offering three different levels of yoga to fit your needs, as well as special in-store events! Also, I’ll be running a Couch to 5K Accountability over on the Facebook page this month! If you have always wanted to try running but didn’t know where to start, now is the time to give it a shot and have a group to support you on your new journey. If you’re local to me, I’ll also be hosting a live group three times per week. Leave a comment or hop on over to my page to let me know you’d like to join. I’ll be posting more info this week as our start date will be September 9th! We are a week into the August Clean Eating Accountability and Yoga Challenge and I’m loving it! I’ve been following a good 80/20 rule with my eating and even that 20% has been full of smarter choices. A new challenge always means new recipes for me, so I hit Pinterest and started searching for Clean Eating and Whole 30 meals that looked good to me…then I put my own spin on them. The recipe I’m about to share is a combination of two recipes I found on there. One was a stuffed chicken thigh and the other was a bacon wrapped chicken thigh. Both sounded delicious and I couldn’t choose which one sounded better so I decided to merge them together, make a few changes to the stuffing and the results were delish!! Open the chicken thighs and lay them out flat. Sprinkle with your seasoning, then spoon some of the mixture into each thigh. Roll it up and then wrap with a slice a bacon. Place each thigh, bacon seam down on your baking pan. Bake for about 40 minutes, or until a meat thermometer reads the proper temperature, between 165- 175 degrees. These were really easy to make and they tasted amazing! I served them with some roasted sweet potato and zucchini. As for yoga, I’m REALLY loving this series and I’m so happy I stumbled upon it on YouTube! Having a quick, program that is beginner friendly has been key to me sticking with daily practice. I’m also happy to report that I have started running again! It felt good to get back out there and while my legs are really sore right now, I didn’t lose that much progress, which was a pleasant surprise. If you are hearing about this for the first time, please join us over on Facebook for daily accountability, recipe and snack ideas and of course, the daily yoga video! Back in March, I was participating in the #FurtherFasterFurther badge challenge and feeling like a total badass. I was on the top of my game and achieving things I never thought I could do. One Saturday I was scrolling through Groupon and found an amazing deal on the Rugged Maniac mud run, so I obviously bought it and felt instant happiness! Poor Mike. Fast forward to July 14th….race day. I had fallen off the running wagon, my cardio wasn’t close to where it should be and I was now nervous as I drove to the event with Mike. I didn’t know if I could hack the obstacles that were waiting for me, but thankfully we were doing the race with Mike’s childhood friend, Irwin and his two kids, Jess and Ryan… and this wasn’t their first mud run! We arrived early to park, pick up our race packets and hang out for a bit. We were in the first wave for the day, and I was grateful for that since it was going to be in the upper 90’s! Our first obstacle was a wall that you had to jump in order to get to the starting line. I honestly felt a little intimidated by it, but I made it over on the first try, and I felt the doubt wash away and some confidence kick in. The first stretch of the course was a pretty easy 1/2 mile run before we hit our first obstacle, which were two A-frames that we had to climb up and over. From there, we headed into the woods and were greeted by ankle to knee-deep mud (which smelled awful) and some 5 foot walls to hop, like the one at the start gate. These were a little trickier to do because my feet and the wall were slippery with mud, but I made it over all of them on the first shot, which made me feel kinda badass again. From there it was more mud and then a football style tire run with swinging tires that you had to push through. Our reward for making it through was a water station, which ended up being the only one on the course! After our water break we headed onto around the motocross hills and toward the barbed wire obstacles. Thankfully the barbed wire wasn’t as low as I was anticipating, so I was able to crawl under it without army crawling. The downside to crawling? I wore shorts and didn’t have knee-pads so my knees got really cut up! Lesson. Learned. The next obstacle I remember was the slide! Nothing like sliding into a lake of muddy water to cool off! I honestly don’t remember the order of the rest of the obstacles. I think the drainage pipes were next and I skipped that one. I’m EXTREMELY claustrophobic and didn’t feel like having a panic attack if I had a hard time making my way back up the second pipe. I think it was this obstacle where my teammate Jessica’s hair got stuck in the barbed wire while making her way between pipes….OUCH! Thankfully there were lots of sprinklers along the course so you could wash mud off your hands and out of your eyes. Although the one time I needed a sprinkler I couldn’t find one. I lost my traction going down a small mud slide and ended up going completely under the muddy water at one point. I wasn’t expecting it so I didn’t have time to hold my nose and ended up with mud in the my eyes and up my nose….talk about gross! I had to skip the obstacle after that because I couldn’t see. A big thank you to the volunteer who offered me a clean spot on her t-shirt to wipe my eyes! From there it was the fire jumps and then off to the final obstacle which I failed at. Between the mud in my eyes and the amount of mud on the wall, I just couldn’t pull myself all the way up. I was pissed I couldn’t make it to the top and across the cargo net, but I achieved a lot and I was proud. Mike and I waited for our teammate on the other side of the wall and then we sprinted to the finish line (and Irwin’s kids who ran off ahead racing each other to the final obstacle and finish line. I loved the competitive nature between them)! The finish line had a water table which was a welcome blurry site. I grabbed two bottles and started rinsing out my eyes, while rehydrating. From there we showered off, headed to the truck to change and then went back to the after party for our post race beer, music and snacks! Overall, the course was challenging but not awful. I loved seeing all of the team-work going on around us as well as all of the laughter. I can’t wait to do another mud run with this team….they were awesome! Have you ever completed a mud run? Which one and what did you think of it? Yesterday I hit the halfway mark on my journey to 500 miles. It came a month later than I thought, I almost got hit by a falling tree branch on the trail and I apparently didn’t lace up correctly, because I ended up with a killer blister, but I did it! Did you get up and go for a run today? If not, there’s still time!